The Siberian Husky is susceptible to epilepsy, hip dysplasia and eye problems. It is important that when contacting a Siberian Husky breeder that you express health concern issues and ask the breeder what they are doing in order to help mimimize them. Please don't purchase your Siberian Husky from a petstore which commonly are known to support Siberian Husky puppy mills. Doing so only promotes inproper breeding ethics and promotes current Siberian Husky health issues. 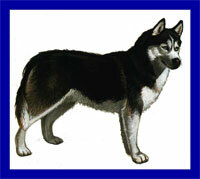 The AKC, UKC, FCI, CKC, SKC, WWKC, FIC registries recognize the Siberian Husky breed standard. Country of Origin: USA - Developed more than 3,000 years ago by the Chukchi tribe based along the coasts of the Arctic and Pacific Oceans on the peninsula that reaches out from Siberia toward Alaska. Because mostly women cared for the dogs, they were used to children and accustomed to being part of the family. Brought to the US in the 1800's by Olaf Swenson a fur trader and explorer. Siberians won the big Alaska Race 3 consecutive years. Team led by Balto ran serum to Nome in 1925 averting a diptheria epidemic. Temperment: This dog gets along well with other Huskies, but needs to be trained carefully in order to interact with other household pets. It will not get along with cats or other small animals. Huskies have no problem with children. It is wise to have more than one Husky because they have a very hard time being left alone. Care Occasional grooming with a brush and comb is required, particularly when the dog is shedding. Comments: The Husky is a working dog and, if not given adequate attention, exercise, training, and discipline, can be stubborn and easily bored. Tend to be aloof but love people. High energy, has tendency to run and dig, have hunting instincts. Love cold .